Magick is a great subject to investigate. It leads you to a lot of very interesting topics which demand your attention. Just before Christmas I was in a discussion in an internet Forum about magick, the occult and other secret things. And I was rambling along the lines that there are fairly little secrets around especially knowledge wise and even less if you really start to investigate things. Fremasonry for example, you should be able to find every little information that the Brethren have, what you do not find is the experience of a well done Ritual. The other guy just stated quite quickly: “Well Sangaku is” and with this he send me of to an interesting intellectual journey. Of the world’s countless customs and traditions, perhaps none is as elegant, nor as beautiful, as the tradition of sangaku, Japanese temple geometry. From 1639 to 1854, Japan lived in strict, self-imposed isolation from the West. Access to all forms of occidental culture was suppressed, and the influx of Western scientific ideas was effectively curtailed. During this period of seclusion, a kind of native mathematics flourished. 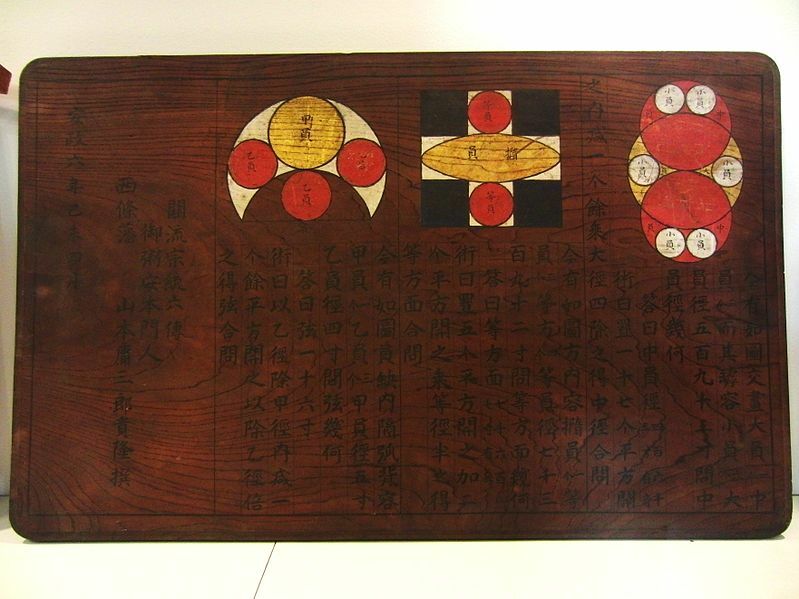 Devotees of math, evidently samurai, merchants and farmers, would solve a wide variety of geometry problems, inscribe their efforts in delicately colored wooden tablets and hang the works under the roofs of religious buildings. These sangaku, a word that literally means mathematical tablet, may have been acts of homage–a thanks to a guiding spirit–or they may have been brazen challenges to other worshipers: Solve this one if you can! For the most part, sangaku deal with ordinary Euclidean geometry. But the problems are strikingly different from those found in a typical high school geometry course. Circles and ellipses play a far more prominent role than in Western problems: circles within ellipses, ellipses within circles. Some of the exercises are quite simple and could be solved by first-year students. Others are nearly impossible, and modern geometers invariably tackle them with advanced methods, including calculus and affine transformations. If you are at all interested in Geometry or sacred geometry this is a really great topic to look into. 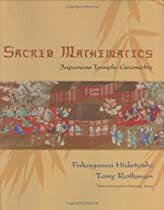 I bought the Book Sacred Mathematics: Japanese Temple Geometry and I am still very fascinated by it. My thoughts on this are still stuck on the Question: “What is the sacred in Sangaku Geometry” and I would be happy to get comments about it. ~ by Otto on March 7, 2014.
able . . . It is the true method . . .
Perfektion und ewigkeit, unveränderlichkeit…. Attribute des “heiligen” (sacred) als auch der Geometrie.